We want to learn as much as we can from as labeled little data as possible. We focus on text classification. Why? The feature space is simple — its just words. With the true labels, a simple SVM gives near perfect accuracy. Text satisfies the cluster assumption. Why isn’t this done all the time? creating the input data is hard. setting the input parameters is harder. we can’t always distinguish the good solutions from the bad. The 1st post looked at (1); here we try to understand (2&3), and look for simple, practical heuristics to make these old methods useful. We can think of the TSVM/S3VM as generating several potentially good labelings on the unlabeled data. To solve (3), we need to find the best labeling–which means judging the label and/or classifier quality, such as the label entropy , cluster overlap, etc. Or, alternatively, we might try to average the good solutions, similar to the way Hinton et. al. have recently suggested averaging an ensemble of models to take advantage of Dark Knowledge. Thanks to Matt Wescott for pointing out this PDF and discussions on it. Our work is guided by the results in this 2014 paper on the QN-S3VM method, as applied to text data. We thank Fabian Gieseke for help in reproducing and understanding these results. All these codes are Unix standalone C programs except QN-S3VM and Scikit-Learn, which are Python. We examine SvmLin and its MultiSwitch (MS-TSVM) method. We do not consider cases of weakly-supervised learning, where the labels may be both missing and/or have errors… but let me point out a 2013 paper on the WellSVM method. It also compares the above methods and is worth a read. We care about text classification. To this end, we reproduce the performance of SvmLin, and, later, other methods, on the real-sim text dataset (listed in Table 2 in the paper). 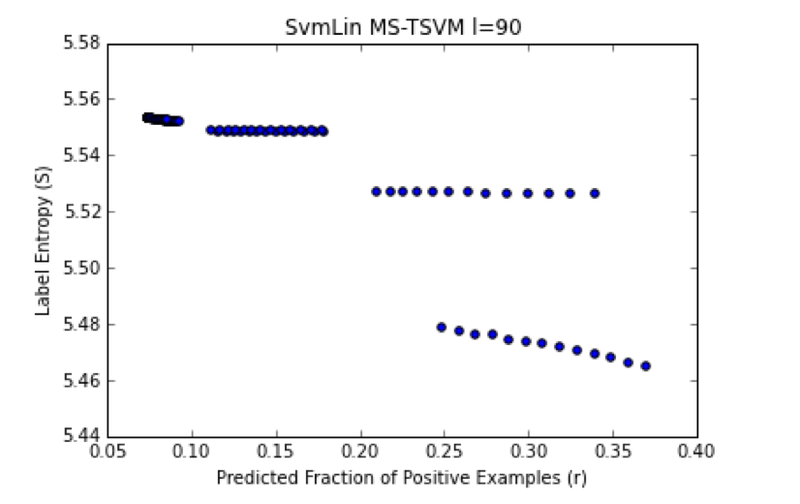 The real-sim dataset was used in the original SvmLin paper; it is an accepted baseline for these methods. This data set consists of 72309 labeled documents: 22238 (+1) and 50071 (-1). The fraction of positively labeled documents . I have created an IPython Notebook (make_realsim_inputs.ipynb) which can read the real-sim data and generate the input files for the various C programs listed above: SvmLight, SvmLin, & UniverSvm. The real-sim dataset is split in half, and 3 data sets are created. Half is used to train TSVM (labeled L and unlabeled U); the rest is a holdout set (HO) for testing. an unlabeled set (U) of size u=36154-l.
Each data set (L,U,HO) also has ~0.31 fraction of labeled examples; U and HO are statistical replica’s of L, albeit larger. The input files consist of a training file (or 2 files for SvmLin) and 3 test files (6 forSvmLin): labeled L, unlabeled U, and holdout HO. They are in the SvmLight format. Astoundingly, rather than performing a full grid search, many research papers fix the regularization parameters, guess them using some crude Bayesian scheme, or attempt to transfer them from some other data set. This makes it really hard to evaluate these methods. We use a ruby script and the gnu_parallel program to run the command line unix programs and grid search the parameters. The script also computes the final HoldOut accuracy and metrics such as the margin and label entropy. Gnu parallel lets us easily grid search the regularization parameters by running the TSVM codes in parallel. How can we evaluate the accuracy of our TSVM, here, and in a real world setting? Since we know the labels on both the U and the HO sets , these are a ground truth from which we can evaluate how well the best model(s) perform. 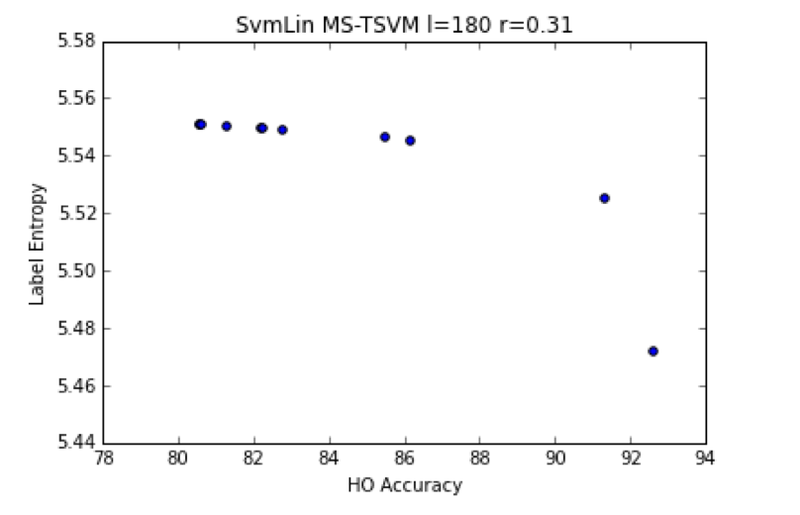 We can get an upper bound on the best possible Generalization Accuracy (on the HO set) by training an SVM on L+U using the true labels, and then applying this model to HO. Also, note this is different from the Reconstruction Accuracy on HO, which is > 99 %. We might also obtain a better generalization accuracy with different features, such as applying GloVe or even unsupervised pre-training on L+U. We examine this in a future blog. We are, in particular, interesting in comparing the Deep Learning Auto-Encoders with Convex NMF, including recent variants applied to document clustering. We need a baseline for comparison. 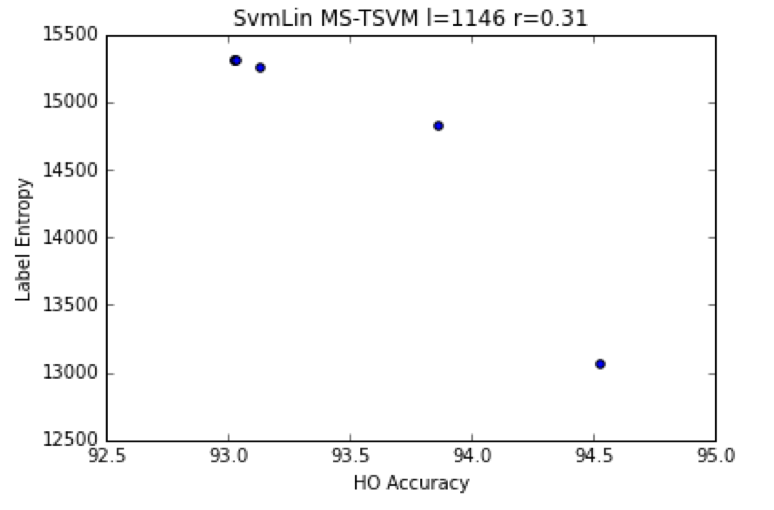 The IPython Notebook computes a baseline accuracy for the labeled data set (L); this can also be done with LibLinear or even SvmLin (using -A 1). please note that these are computed from 1 random sample, and may be slightly different (by ~1%) for each run. Also, that the command line and scikit-learn liblinear have different defaults; we use C=10,fit_intercept=False. The inputs are related to the objective function in blog post 1. Every useful model will have the same reconstruction accuracy on the labeled examples L, and every model proposes a different soft labeling for the unlabeled examples U. How can we compare different models ? Essentially, we use a margin method to guess good labelings of the data, but we need an unsupervised heuristic to select the optimal labeling. Can we simply apply Cross-Validation to the small labeled set L? Or Leave One Out CV (LOO-CV) ? What filters can we apply to speed up the calculations ? SvmLin may produce inferior or even nonsense models. But more subtly, some models may even have a very high training (on U), and a very high test accuracy (on HO), but a very low accuracy on L. These are not useful because in the real world, we don’t know the labels on U or HO. We always want to first filter the possible solutions by selecting those with the best accuracy on the L.
Since we are minimizing the objective function, we only consider solutions with FOF < 0.01. Note this is very different than simply assuming the best solutions has absolute minimum FOF across all input parameters. For l=180, for example, this reduces the set of possible solutions from 1430 to 143. No. Think about how we practice supervised learning; we train a model, and set the regularization parameters by cross-validation. In the TSVM and SSL methods, we can can also apply CV (or LOO-CV), but only to the labeled set L.
The maximum margin solution is only best for a given set of input / regularization parameters (U,W,R). Every model induces a different labeling on U (that is, they form an equivalence class on L, not L+U). In fact, the best overall solution has the minimum margin amongst a broad scan of (U,W). The SvmLin DA algo minimizes the entropy on unlabeled examples (it is the key stopping criteria, sec 3.2.3). Perhaps the model with minimum generalizes best? This is the essence of Entropy Regularization--a common component of many Semi Supervised Learning formulations. 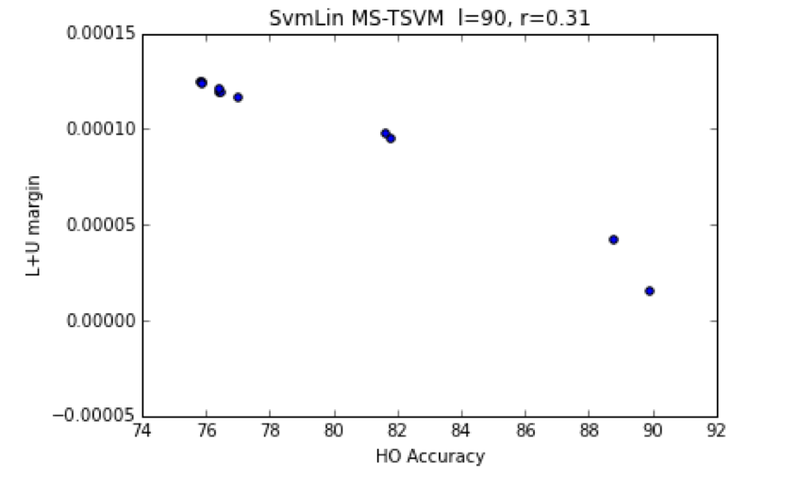 We hope that TSVM solutions with minimum will consistently yield a very good Generalization Accuracy (on the HO set) across a grid of search (U,W,R)–and preliminary results confirm this. Let’s look at the l=90 case, and plot first the HO accuracy vs the Label Entropy . We call these Equivalence Classes under the Label Entropy. We select the minimum Entropy class of solutions. where the percentage of labeled data is of U. Recall we have to input an estimate of the fraction of positive labels on U . We would prefer a high quality estimate if possible because the final, predicted and appears to depend strongly on . The predicted fraction also forms Equivalence Classes under the Entropy . Of course, we know the true , so the minimum Entropy solution is not the absolute best solution. Perhaps a more generalized form of the Entropy would be more discerning? We would prefer a python toolbox like this one and need a way to fit the parameters. 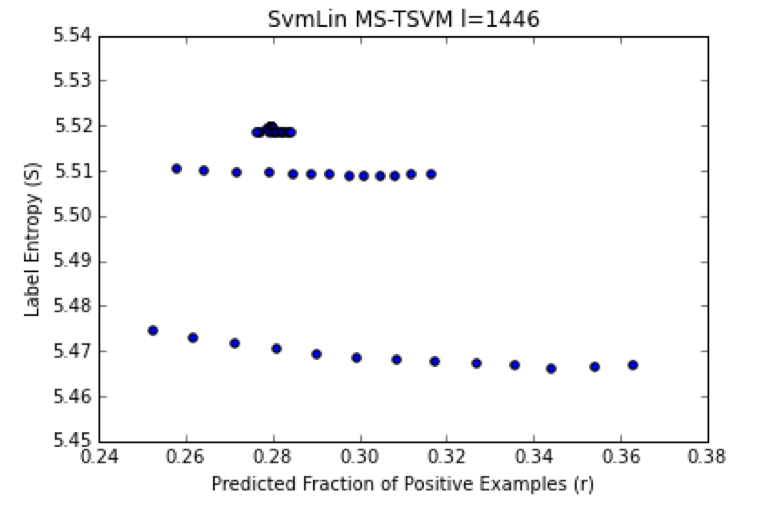 We might also try to improve the TSVM search algorithm, as in the S4VM: Safe Semi-Supervised SVM methods. 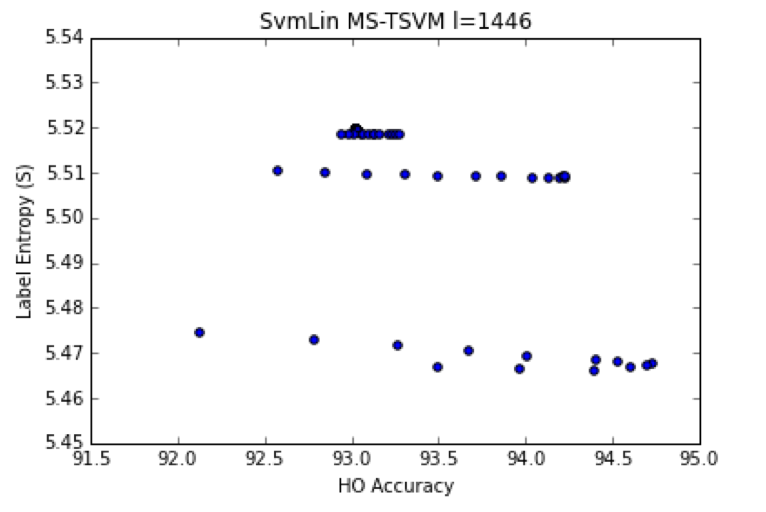 The S4VM tries to improve upon the SvmLin DA-TSM algo using Simulated Annealing, and then selects the best solutions by evaluating the final cluster quality. This looks promising for simple applications. Indeed, one might even try to implement it in python using the recent basinhopping library. We have said that the VC Theory is a really theory about Transductive Learning. We see now that to apply the TSVM in practice, the unlabeled data set U really needs to be an accurate statistical replica, as in the VC Statistical Learning Theory for Transduction. We have tested cases where we have a good replica, but we did not estimate well; we have not yet tested cases where the U is NOT a good replica and we can only estimate partially. This needs to be done. In the literature this is called using class proportions, and some recent estimatation methods have been proposed (and here)–although the QN-S3VM papers do not attempt this. Recently Belkin has shown how to estimate this fraction using methods of traditional integral methods. The TSVM accuracy may depends on how well one can estimate the fraction (r) of positively labeled examples. Also, we presume that TSVM models overtrain, and are biased towards either the (+) or (-) class. with , W=0.001, U=1 and . They all have a high HO Accuracy–but may be biased towards choosing (+) labels because the minimum S solution has , not 0.31. This is what Dark Knowledge, is all about–creating a simpler model by ensemble averaging– and we hope these recent advances in Deep Learning can help with Transductive Learning as well. It is noted that the recent WellSVM method also addresses this problem. WellSVM uses a convex relaxation of the TSVM problem to obtain a min max optimization over the set of possible models allowed within a range of ; this is quite clever! In a future blog, we will examine how the current TSVMs perform when tuning their parameters to obtain the best predicted fraction. If this is sound, in a future post, we will examine how to estimate the class proportions for text data. Each is TSVM is trained with a linear kernel. The regularization parameters are adjusted to give both optimal performance on the initial training set (L), and best reconstruction accuracy on the (U) set. Each program requires slightly different command line options for these. There are also tuning parameters for each solver, and is necessary to set the tolerances low enough so the solvers can converge. For example, even for a linear SVM, the primal solvers may not converge as rapidly as the dual solver, and can even give different results on the same data set (despite Von Neumann’s minimax theorem). And the default for sckit-learn LinearSVC has the Bias on, whereas LibLinear has the Bias off. So be careful. Below we show examples of training each the TSVMs on the labeled set (L), and evaluating the accuracy on a HoldOut set (HO), for l=90. We show typical values of the regularization parameters, but these do need to be tuned separately. We also show how to run the popular Liblinear program as a baseline (which uses the svmlight format); the paper uses LibSVM.